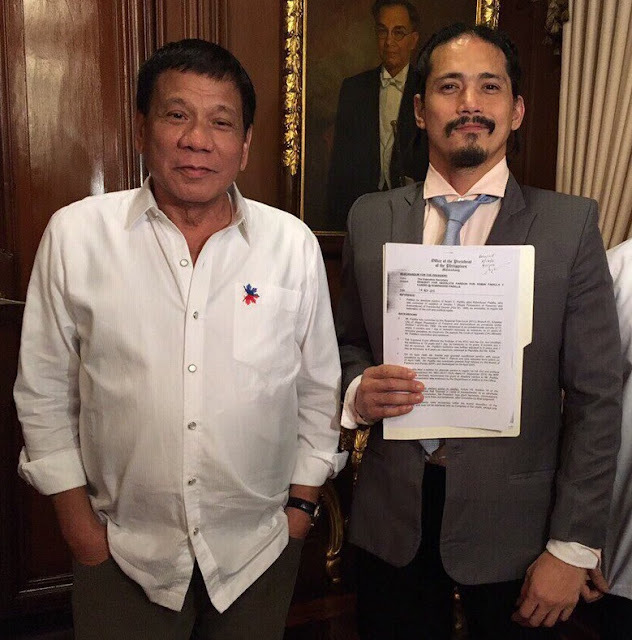 Movie and TV personality action star Robin Padilla was invited in Malacañang Palace last Tuesday November 15, 2016 to have a dinner meeting with the Philippine President Rodrigo Roa Duterte. But the supposed dinner meeting surprised the actor after President Duterte hands over the papers that grants Robin Padilla's absolute pardon. Why Robin Padilla is receiving “Absolute Pardon”? On 1994, at the time of Padilla’s popularity as one of the biggest action star in movie industry, he was arrested after being caught for having illegal possession of fire arms. In 1995 he began his serving at the New Bilibid Prison, where he was sentence up to 21 years of prison. In 1998 he was pardoned and released by then Pres. Fidel V. Ramos but granted only with conditional pardon. Since then Padilla, has no right to vote, travel outside the country and removing all his political rights and civil rights. Since that he cannot travel outside the country in fact, his wife Mariel Rodrigues gave birth in the US and the actor left behind in the Philippines preventing to leave the country according to the conditional pardon given to him. But this time, Pres. Duterte, revise the conditional pardon to absolute pardon giving Padilla all the rights of a free man. Padilla, was included among of the names recommended by the Board of Pardons and Parole for executive clemency just this August. The president think that the crime committed by Robin Padilla doesn’t hurt anyone and this is the time to give back his rights to vote, travel, apply for a new gun license that gives back all his political and civil rights. Meanwhile, the president is also open on granting absolute pardon for all prisoner that already serve 40 years but not younger than 80 years old. No Comment to " Robin Padilla Gets Back His Full Restoration of Political and Civil Rights "